A colleague recently put me onto the notion of the ‘Power Distance Index’ or PDI. I immediately was intrigued as I thought this might help explain some of what I had experienced while working on an organizational transformation project in the Philippines the past 3 years. When I first started working with the organization, the project team that had been put together by the senior leaders would sit silently while visiting international consultants asked questions to prod feedback and input into the various tasks at hand. Why wouldn’t they talk? Was it English? Filipinos would joke about getting a ‘nosebleed’ if they had to speak too much English. Was it that they simply couldn’t think for themselves? I racked my brain endlessly thinking of ways to get the local team to think critically, voice their ideas, and participate in the development of the program. By Julie Peachy. Cross-posted from Leadership Beyond Boundaries. Just over three years ago, I found myself in a developing country managing a project that would help about 350,000 poor people save money. The project was essentially an organizational transformation of a large microfinance institution. We’re winding the project down now and I’m reflecting on what we did well, not so well, or maybe not at all. I often thought of my role as Project Manager like that of an air traffic controller. We had so many consultants on the project — from internal controls to financial risk management to marketing to human resources — I had to manage the runway and make sure there were no collisions in the comings and goings of the consultants or senior management. Not just physically, but emotionally. I spent a good bit of time that first year making sure that the work of each consultant would be seen as a success by the senior management and that they would embrace and implement the various recommendations. I made sure that everything was happening according to plan. Grameen America: Bringing Microfinance to the U.S. Recently I had the pleasure of visiting our sister organization, Grameen America, which has been providing microfinance services to low-income, mostly Hispanic clients in New York since 2008, and has since opened branches in Omaha and Indianapolis. My host was GA’s CEO of Operations, Shah Newaz, someone I have known for more than 20 years. 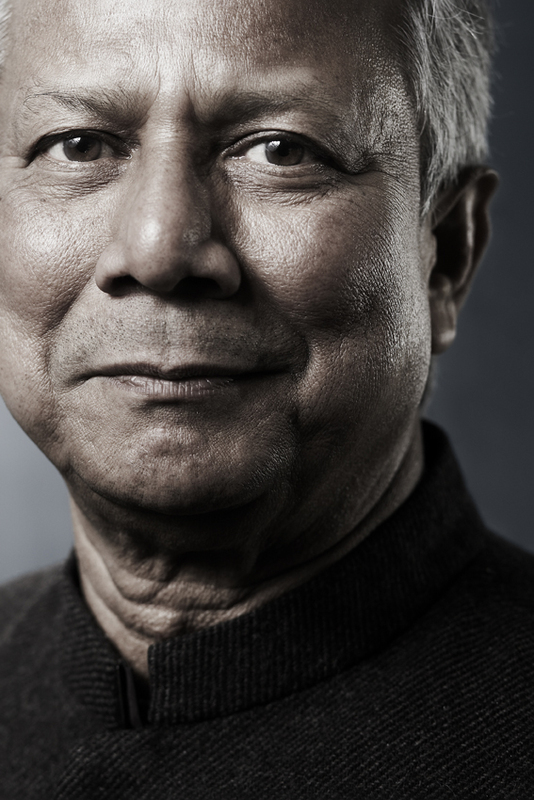 When I first arrived in Bangladesh, Shah was head of Grameen Bank’s audio-visual unit, and later became the longest-serving zonal manager in the bank’s history. (A zonal manager is the most senior field-based position in Grameen Bank’s structure.) Some years after that, he served as a senior technical consultant for Grameen Foundation in the Dominican Republic, where he did a great job and picked up some Spanish (which he has continued to perfect in his new role). I was interested in how GA was progressing for a lot of reasons. My book Small Loans, Big Dreams extensively examined one of the earliest microfinance programs in the United States, the Full Circle Fund. While doing that research, my eyes were opened for the first time to the vibrancy of the grassroots economy in many inner-cities. Later, I became involved in microfinance institutions in the United States that Grameen Foundation also supported: Project Enterprise in New York City, the PLAN Fund in Dallas and the New Opportunities program of Volunteers of America in Los Angeles. 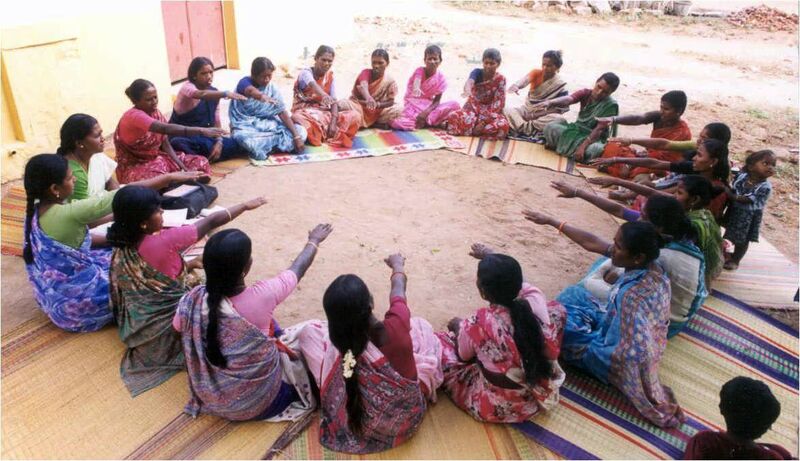 Though the LA program was phased out, the other two continue providing microfinance effectively while drawing on the Grameen Bank model extensively. However, they operate on a relatively small scale, even as they try to serve a lower-income population (including many African-Americans) than other microfinance and microenterprise programs here serve. A guest post from Sam Daley-Harris, Founder of the Microcredit Summit Campaign, which seeks to reach 175 million poorest families with micro-loans, and of RESULTS, which seeks to create the political will to end poverty. The dismissal is not the lone action of one government institution, but is part of a premeditated campaign that starts at the highest level, with Prime Minister Sheikh Hasina. Their reason for sacking Prof. Yunus? He’s “too old.” Never mind that the 70-year-old Yunus maintains a rigorous schedule or that the Finance Minister, another key player in the sacking, is at 77 somehow not “too old” for that post. The dismissal of Prof. Yunus from his post as Managing Director of Grameen Bank could portend ominous changes by the Bangladesh government. Their excuse would be laughable if it were not for the calamitous impact it portends. What makes the decision to remove Prof. Yunus so disgraceful is not that he would be out of a job – any university in the world would welcome him with open arms as a visiting professor. No, the atrocity here is the fact that the independence and integrity of one of the world’s premier poverty-fighting institutions is now at grave risk. Grameen Bank, an extraordinary institution with more than 8 million microcredit borrowers that took 35 years to build, could be destroyed in a matter of months by incompetent government action. The government’s action cannot honestly be in response to accusations by a Danish documentary maker about an improper transfer of Norwegian aid funds more than a dozen years ago, because both the Norwegian government and Bangladesh’s own review committee have found that Grameen Bank did nothing wrong. It cannot be due to the documentary maker’s charge of excessive interest rates, because Microfinance Transparency and the government’s own review committee found that Grameen Bank has the lowest interest rates in the country. Instead, most observers see this as an inexcusable political vendetta by the Prime Minister against Prof. Yunus, stemming from his short-lived attempt to start a political party in 2007. In 1976 he made loans of less than US$1 each to 42 desperately poor Bangladeshis to start or build tiny businesses – and the microcredit revolution was born. It has made its way all around the world. While others have seen microfinance as a way to make big money for investors, Prof. Yunus has never once diverted from his original intent to empower the poor. In 1997 Grameen Phone Ladies started bringing cell phone technology to remote villagers throughout Bangladesh – providing the dual benefit of creating jobs and increasing communications, which enhanced others’ work. Grameen Shakti, an energy firm, has installed more than a half-million solar home systems and sold more than a quarter-million improved cooking stoves. In a joint venture with Danone, the yogurt maker headquartered in France, Grameen Danone is bringing low-cost fortified yogurt to malnourished children throughout the country – and creating a business opportunity for the poor women who sell it. College scholarships and loans have gone to 180,000 students. Most remarkably, in almost all of the cases, these are the children of illiterate parents who have had the help of Grameen Bank in breaking the bonds of inter-generational illiteracy. A government that so rashly and ruthlessly ousts this innovative and transformational leader cannot likely be trusted to continue his revolutionary work. 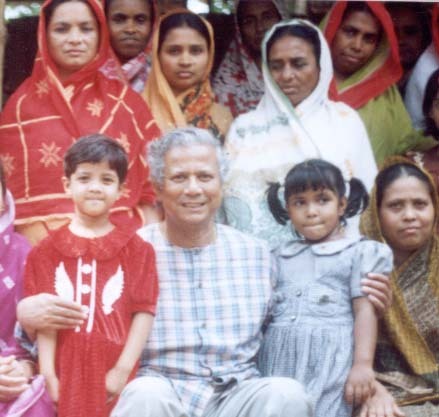 Will the Government of Bangladesh Ruin Grameen Bank? Barbara Weber, who worked at Grameen Foundation from 2002 to 2006, was a Rotary International Ambassadorial Scholar in Bangladesh and is now working on her Ph.D. in depth psychology. Bangladesh went from being dubbed the world’s basket case in 1973 by former U.S. Secretary of State Henry Kissinger to becoming a beacon of development innovation that the rest of the world has since sought to emulate, thanks in large measure to its pioneering in microfinance. This renown is fast turning to infamy, however, as political vendetta cannibalizes the very source of the nation’s well-deserved pride. The country’s acclaim reached a crescendo in 2006, when the Nobel Peace Prize was awarded to Grameen Bank and its founder, Professor Muhammad Yunus, for creating a system that has enabled the poor to pull themselves up by their boot straps. It has done this so effectively that its microfinance model has been studied exhaustively and replicated around the world. What ensued next seems to have won Yunus the ire of the current prime minister, Sheikh Hasina. In 2007, the newly ordained Nobel laureate made a fleeting and ill-fated foray into politics in a vacuum that was created when a military-backed interim government began jailing operatives of the country’s top political parties. Sheikh Hasina herself was temporarily in exile and charged with masterminding crime. 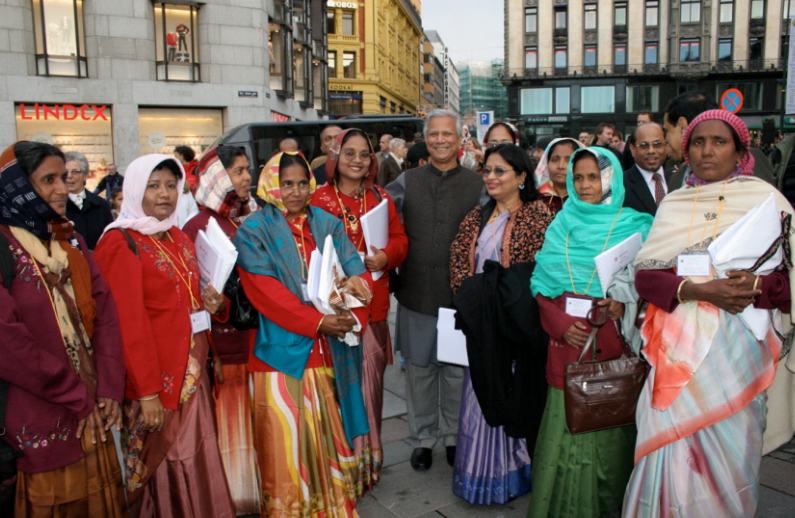 Prof. Yunus and most of the Board directors who represent the borrower-owners of Grameen Bank tour the streets of Oslo the day before receiving the Nobel Peace Prize in 2006. Some saw this as a potential turning point for a country that had topped Transparency International’s list of the most corrupt governments in the world. Bangladesh was number-one on that list for five consecutive years. But when national elections were held in 2008, Sheikh Hasina – who had held the post of prime minister from 1996 to 2001 – again took office. Now, she and her party in power seem intent on systematically dismantling Grameen Bank. In apparent collusion with the current government, the country’s highest court recently upheld the ouster of Grameen Bank’s founder as managing director. The Supreme Court will have one more opportunity to review the case in a ruling that is due on May 2. In the meantime, Prof. Yunus remains managing director of the Bank while the world watches attentively and awaits Bangladesh’s next move. Alex Counts is President, CEO and founder of Grameen Foundation. 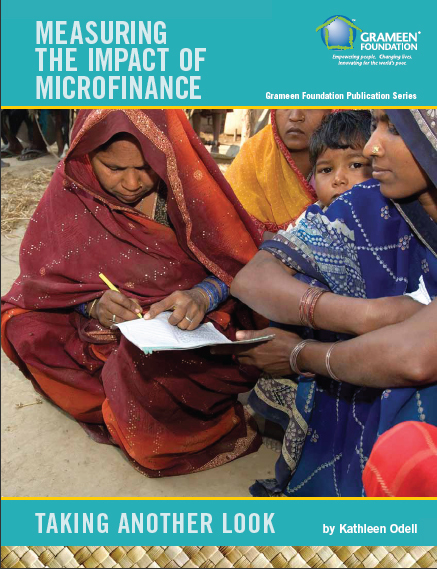 "Measuring the Impact of Microfinance: Taking Another Look" is the latest report published by Grameen Foundation that examines the studies of the effectiveness of microfinance as a tool to alleviate poverty. One of the most confusing and contentious issues covered in both reports is the controversy regarding the well-known Pitt/Khandker studies on the impact of three major microfinance institutions in Bangladesh, including Grameen Bank. In general, their research found many positive, statistically significant impacts on clients when measured against comparison groups. Despite being one of the few microfinance impact-assessment research studies that has undergone a rigorous peer-review process prior to its publication in an academic journal (the Journal of Political Economy), it has been criticized as being flawed and unreplicable by other researchers using the same data. These criticisms have been leveled by NYU Professor Jonathan Morduch (a respected researcher) and Roodman (microfinance’s most widely read and respected blogger). Though I lack a deep understanding of econometrics (on which the Pitt/Khandker study relies), I have probed into this debate, as Odell and Goldberg did in their papers. Interestingly, I was alerted last year that an article that was supposed to conclusively prove that the Pitt/Khandker study was wrong was itself rejected from a peer-reviewed journal. It may still be published, though. Most recently, Professor Pitt has published a detailed response to the criticisms of his original research with Khandker. He claims that Morduch and Roodman made errors of their own in their analysis of his data, and when those errors are corrected, the original findings stand up. The paper’s abstract states, “This response to Roodman and Mordoch seeks to correct the substantial damage that their claims have caused to the reputation of microfinance as a means of alleviating poverty by providing a detailed explanation of why their replication of Pitt and Khandker (1998) is incorrect. Using the dataset constructed by Pitt and Khandker, as well as the data set Roodman and Morduch constructed themselves, the Pitt and Khandker results standup extremely well, indeed are strengthened … after correcting for Morduch and Roodman errors.” Roodman has just published a preliminary response on his blog. What are the main takeaways at this point? First, in the world of social-science research, things are not always as they appear. Individual studies should be taken with a grain of salt, as all have their strengths and limitations. More than ever, I think the safest course is to reflect on more than two decades of research using experimental, quasi-experimental and non-experimental designs, as well as personal observations (for those of us who have spent time with microfinance clients) and qualitative research, such as that found in Portfolios of the Poor, a terrific book co-authored by Professor Morduch, and my book, Small Loans, Big Dreams. Objective efforts to demystify research findings, such as the Odell and Goldberg reports and another solid treatment by Freedom From Hunger President Chris Dunford, should be reviewed by microfinance practitioners, investors and volunteers. Finally, there is no “gold standard” in research, but rather a growing body of evidence that microfinance is an incomplete but improving strategy to address global poverty – one that can be made more effective by refining it based on available research, as well as by having regular feedback loops involving social-performance data that Grameen Foundation will continue to ensure becomes a part of our industry’s DNA.